This traditional scalloped 20 inch lamp shade is offered in a choice of 6 stunning colours and fitted with a 10cm duplex ring that requires a shade carrier. A suitable shade carrier can be found by following this link to our Lighting Accessories section. A classic 57cm scallop lamp shade, fully lined, with trim finishing the top and bottom edging. Quality shades that will help you re-vamp a tired floor lamp or give a new lease of life to your favourite large table lamp. Available in a choice of colours including grape, pale pink, sage, duck egg, soft grey and sand. Please see the image and let us know your choice in the special instructions box at checkout. Please note that the soft grey and sand shades differ slightly from the rest and have a deeper scallop. 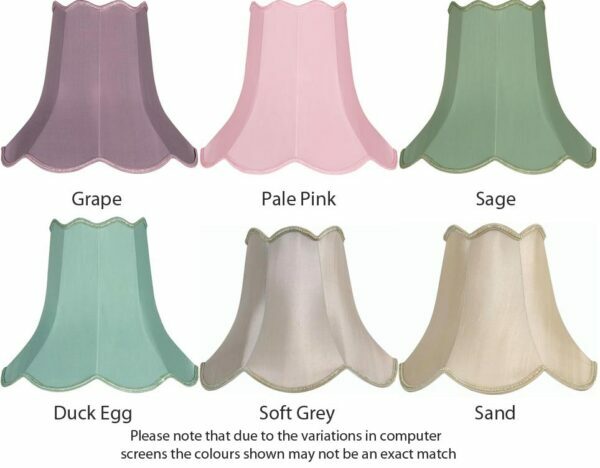 How do I choose the colour of scalloped lampshade 20 inch. It’s hard to see from your site how to choose it. Hello Wendy, please enter your colour choice in the special instructions box at the checkout. We would recommend an 8inch shade carrier to suit this shade.